By next check-in, it will be February. This first month of 2012 has blown by so quickly. I feel like round one just got started a few days ago, but that is not the case. Instead we’re twenty-eight days into this eighty day journey. I’m totally excited about the progress in some areas and less than impressed with others. A mixed bag. Reading– I finished Patrick Rothfuss’ The Name of the Wind. In the end, I’d say I’m more than luke warm about it, but I won’t be having any fangirl meltdowns about it either. This book was extremely slow moving in too many places for me. I’m invested enough in the main character, Kvothe, to read the next installment. I hope it picks up. I went back to Story Engineering as well. Knocked out a few more chapters of that this last week. Got some pages in today. Novel Analyzing– Haven’t worked on that at all in the last few days. And when I’m truly honest with myself, I realize that I’m just being stubborn. I asked myself a question: Would I rather sacrifice the drill for the sake of finishing the book or sacrifice the book for the sake of finishing the drill? When I look at it that way, the answer is clear. I’ve been trying to prove to myself that I can finish this book and slowing my overall progress in this area down to a snail’s pace. I hate quitting things, but sometimes that is the best option. Forcing myself to stick with it is not an efficient use of time in this situation. There is a big difference between activity and productivity, and I’d much rather be productive than merely active. I’m starting a new book this week with the option never to return to the book that shall not named. 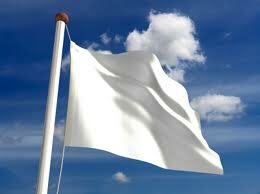 Waving the white flag and moving on. Writing- I am most pleased with the happenings on this front. My 250 word test mile has been the most successful thing I’ve implemented so far this year. I have written every day this month. I haven’t written this consistently in a while. I’m going to start participating in some sprints again. Those are always fun and productive for me. How are you feeling after your first month of the new year? Hope you guys are having fun and hitting your marks. Catch ya Wednesday! This is my path; I get to make the decisions. With all the writing advice out there, sometimes it’s hard not to wobble to and fro trying to keep up with it all. It is absolutely exhausting trying to read every blog or book that’s recommended. Or trying to match my way of doing things up with some successful author validated routine. I have been making myself crazy. I found myself on Amazon the other day looking through books that were recommended to me and discovered that I was completely unmotivated to read them let alone buy them. They’d just become more shoulds on a list that I’m already working to shorten. I’m choosing to spend more time doing the activities that I want to do and the ones that I feel will benefit my writing the most. I am officially in charge. The writing is still going well. I haven’t missed a day. I’m thinking that 250 will probably become my permanent test mile number. It seems that I can bang out that number no matter what. I’ve tried 500 words before and found that I tend to miss a few days. I used to write 250 word articles for a website. I think that I’m so used to that word count that it is second nature at this point. I haven’t done any novel analyzing work since Wednesday, and I’m okay with that. Of all the goals I’ve set for myself, it is the one that gives me the most grief. And to cut down on that angst, I’m letting go of the time frame I set for myself. I’m not adjusting it. I’m scrapping it altogether. The funny thing is I’ll probably get it done faster because I’ve stopped pressuring myself. Story Engineering is getting it’s due. I’m not a fast reader in general, but craft books, especially the good ones, tend to be slower reading for me. Still loving it though. I hope all is well with you guys. Happy ROWing! Until Wednesday.